Bali is a rarity in Southeast Asia: a vibrant Hindu-majority community in a region dominated by Islam and Buddhism; a hot tourist commodity where Western and traditionally indigenous ideas sit in a stable yet uneasy balance. Bali’s holiday calendar represents this paradoxical push-and-pull of traditions and influences on the island: a mix of Hindu and secular celebrations that welcome tourist participation in good faith. When planning your visit to Bali, consult this list and sync up your trip with any of the celebrations below! Nyepi, the Balinese New Year, is an interesting anomaly as far as traditional New Year celebrations go. Instead of ringing in the New Year with fireworks and noisemakers, the deeply devout Balinese celebrate Nyepi in near-absolute silence. As the sun sets on the day before Nyepi, Balinese converge on the main crossroad of their respective villages in a raucous celebration known as Pengerupukan, where villagers in Bali carry ogoh-ogoh (monsters) symbolizing evil spirits that burden people's lives. On the day of Nyepi itself, the Balinese stop all their activities, turn off all lights, refrain from entertainment, and fast the whole day. The silence of Nyepi is supposed to fool evil spirits, who will think the island is uninhabited and leave Bali in peace. During Nyepi, tourists are requested to stay in their hotels for the whole day. Activity only picks up on the day after Nyepi, the day known as Ngembak Geni, as Balinese meet up to seek forgiveness from each other. In 2020, Nyepi takes place on March 25. Bali cornered the market on wellness tourism in Southeast Asia long before "Eat Pray Love." The Bali Spirit Festival brings the island’s spirituality to a fever pitch, with a seven-day festival of workshops, concerts, markets and other events. Taking place in Bali’s cultural capital, Ubud, the Bali Spirit Festival brings in visitors looking to explore different dimensions of their spiritual selves. Yoga lovers can take part in classes covering different disciplines: Vinyasa, Astanga, Kundalini, Tantra and more. Dance classes take participants on a different kind of flow, and nightly music festivals combine the best of world music and hypnotic EDM beats. Holistic healing methods, championed by different experts from around the world, can be experienced through sessions throughout the week. And a wide range of other spirituality-related workshops will unfold throughout the course of the festival. In 2020, the Bali Spirit Festival takes place in April (dates TBA). The most important day of the year for Balinese wayang (shadow puppet) performers, Tumpek Wayang sees a flowering of wayang performances throughout the island. The tradition of holding wayang performances on this date is rooted in Balinese myth. Balinese Hindus believe that the god of the underworld, Batara Kala, has cursed children born on Tumpek Wayang; such “wrongly born” people can purify themselves by staging a special type of shadow play called the sapuh leger. When visiting during Tumpek Wayang, check with a local community for a sapuh leger performance, or swing by a local Balinese temple to see the puppets, arranged in a row for blessing by a priest. Tumpek Wayang follows the 210-day pawukon calendar; in 2019, the festival takes place twice, on April 20 and November 16. Bali’s food scene is rich and varied, but the island’s size means you can’t enjoy its full range if you’re just staying for a few days. Time your trip for the Ubud Food Festival instead — so you can just stay in Ubud and watch the food scene come to you! The Festival brings together local and international chefs and food personalities — with the aim of sharing Indonesia’s rich culinary culture with the world. Foodies can visit kitchen stage demos and attend talks presented by famous experts like Indonesia’s William Wongso and MasterChef ice cream maven Ben Ungermann, covering topics as diverse as Peranakan cuisine and slow food. Non-professionals can buy passes to the event to try the Balinese and international dishes prepared for the Festival. 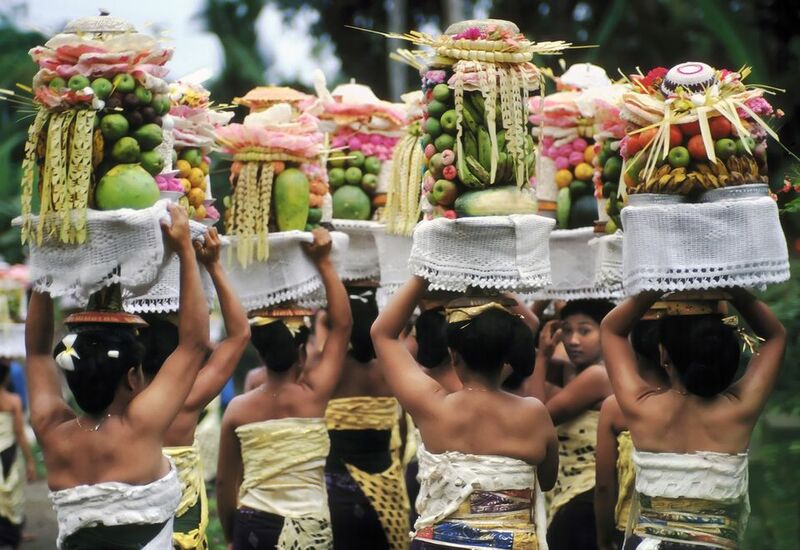 In 2019, the Ubud Food Festival takes place from April 26 to 28. Imagine one whole month celebrating the best of Bali’s native heritage, linking it to modern means of expression. Traditional theater, morphing into modern performances. Culinary exhibitions of Balinese and Western-fusion food. And a whole gamut of art forms on display, from painting to documentary movies to shadow puppets to music. Staged at the Taman Werdhi Budaya Arts Centre in Denpasar, the Bali Arts Festival takes advantage of the Centre’s outdoor pavilions, stages and auditorium spaces to create its art showcase. No two days show the same lineup: you’ll see something new and interesting on every day you visit! In 2019, the Bali Arts Festival takes place between June 16 and July 14. The 210-day traditional pawukon calendar followed by Balinese Hindus honor one festival above all: Galungan, a time when the Balinese believe the spirits of the dead roam the earth. Galungan kicks off a 10-day, Bali-wide celebration that honors the one God above all (Ida Sang Hyang Widi Wasa), also called the Inconceivable (Acintya): as Galungan kicks off, the Balinese show a warm welcome to spirits with rituals in both their homes and in local temples. The Ngelawang ritual is the one sight to see during Galungan: an exorcism ceremony with a man dressed as a “barong” (a mythical beast that symbolizes divine protection). The barong’s rounds through the village is intended to restore the balance of good and evil — locals make a small offering to the barong in exchange. In 2019, Galungan takes place between July 24 and August 3. The winds start picking up speed in July, giving the Balinese a convenient excuse to let their colors fly (literally). Visit Padang Galak Beach near Sanur during the Bali Kite Festival, and watch kite-flyers unleash flying frames bearing a riot of designs: wild animals, boats, dragons, all competing for their piece of the sky. The Padang Galak event is only one of several kite-flying festivals taking place throughout Bali in this time, though it is probably the most prestigious, offering the largest cash prize to participating kite flyers. In 2019, the Bali Kite Festival starts on July 28 and continues till the end of October. The Balinese have had a stellar education in jazz since 2010, courtesy of the Ubud Village Jazz Festival. This year’s event takes place at the Agung Rai Museum of Art, entertaining over 5,000 guests with acts from Indonesia and further afield. The local patronage of the art of jazz is just part of a long Ubud tradition of fervent support of the arts, as evidenced by the many art museums in the area. Beyond just music, the Ubud Village Jazz Festival also takes time to curate food and craft fairs for the less harmonically inclined. In 2019, the Ubud Village Jazz Festival takes place on August 16-17. Sanur in South Bali was particularly hard-hit by the Bali bombing of 2005, but they bounced back in a big way with the Sanur Village Festival, held the following year. Responding to tragedy with an outburst of all that is good about Bali, the Sanur Village Festival annually showcases the best of Balinese culture, tradition and sport — its five days packed with gamelan music, kite flying, beach soccer, and wayang kulit performances. The last Festival drew over 20,000 visitors from start to finish. Several major sports events have been folded into the Festival lineup, including the Sanur Quadrathon (combining biking, running, swimming and canoeing) and an Amateur Open held at the Bali Beach Golf Course. In 2019, the Sanur Village Festival takes place August 16-22. From its first gun-start in 2012, the Maybank Bali Marathon has grown to be a must-see international running event. Over 10,000 runners from 46 countries are expected to sign up this year to run a course known as one of "The 52 Best Races on Earth" by Runners World magazine. Running-minded tourists who sign up for one of the four distances (from kids’ dashes, to a 10k, to the half- and full marathons) can take in a glorious view of Gianyar and Klungkung regencies’ rice paddies and rolling hills while going through the paces. Balinese local wisdom and hospitality will be on display on different points along the race route, with local communities performing songs, dances and other Balinese cultural acts. Watch this video to get a feel of the marathon, its course and the aftermath. In 2019, the Maybank Bali Marathon takes place on September 9. There’s a temple festival (Odalan) happening in Bali on every day of the week — inevitable given the thousands of temples throughout the island. Odalan celebrate the founding of the temple with a parade of offerings by local devotees, accompanied by traditional music. To entertain both gods and the crowds on earth, the temple holds Balinese dance performances. The temple becomes a riot of penjor (Balinese banners), flowers and devotees on the scene to celebrate as a community. Most odalan take place over the course of one or more days, coinciding with either a full or new moon. Every temple has its own odalan, dictated by the 210-day pawukon calendar. For each of the top temples in Bali, we’ve listed the next odalan season so you can plan your trip accordingly.